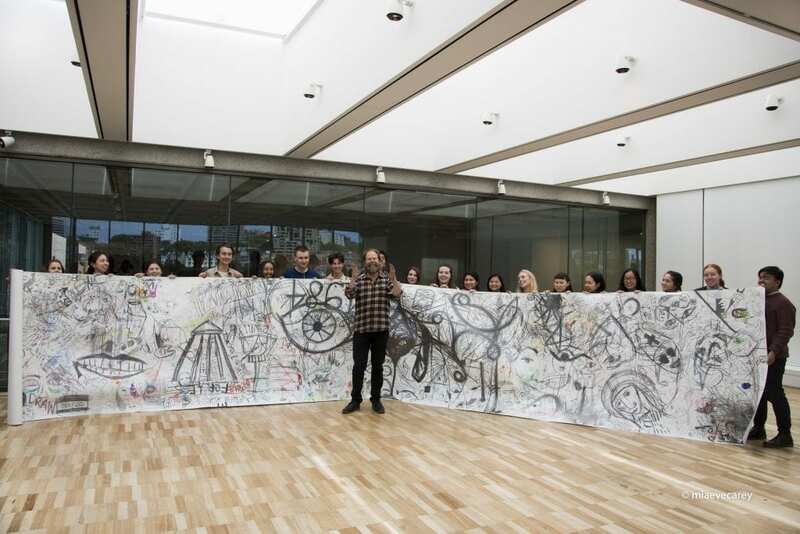 As the Dobell Foundation aptly puts it: “There are news junkies, and then there’s Locust Jones.” Locust held a drawing workshop for the Art Gallery of NSW’s Youth Collective recently, sharing his drawing techniques and collaboratively working on a large-scale scroll paper with the twenty under 25-year-olds participating. This is also the last week to view Locust’s work in the Dobell Australian Drawing Biennial ‘Playback’, which closes this SUNDAY 21 October. Having created this work over the months between New Years and April Fool’s Day this year, Locust says that within this ‘warped diary’ of a work, “the subjects range from insects to war, the Middle East, Saudi Arabia, Donald Trump calling Africa a s… hole, the death of Mark E. Smith from The Fall, a portrait of Jodie Foster, Jacinda Ardern the New Zealand prime minister, Earth, wolves, mass migration, Israel/Gaza, nerve agents and Iran. … With all the information in the world that I ingest and process, I have a fountain of information that I can draw from.” See this scrawling, affective work before it closes this weekend.